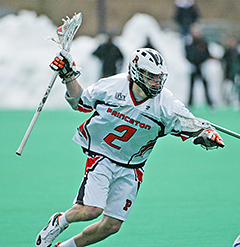 CITY LIMITS: Princeton University mens lacrosse senior midfielder Scott MacKenzie fights off a check in recent action. Last Saturday, MacKenzie notched a goal but it wasnt nearly enough as No. 4 Princeton fell 13-4 to third-ranked Syracuse in the Konica Minolta Big City Classic, the first-ever event in the New Meadowlands Stadium. Mason OBrien and her teammates on the Princeton High girls lacrosse team found themselves in a dogfight last Wednesday against visiting Allentown. When Allentown scored two early second half goals to knot the game at 8-8, sophomore attacker OBrien had a clear idea of what the Little Tigers needed to do to come out on top.